Sweden/Australia, 1977, 100 minutes, Colour. ABBA, Stig Andersson, Robert Hughes, Tom Oliver. ABBA the Movie anticipated the MTV and video clips from the 1980s. It is a combination of documentary, concert, interviews and observation of a tour of ABBA in Australia in the mid-70s. At the time, it was very popular, as was ABBA throughout the world after its victory in the Eurovision contest in 1974 with Waterloo. Their style, their clothes, the popular music made an impact in its time. They were top of the charts for about ten years. As time passed, other styles of music became popular and ABBA was sometimes parodied. This was very clear in some of the songs in Muriel’s Wedding as well as The Adventures of Priscilla, Queen of the Desert. However, twenty-five years after the success in Eurovision, ABBA gained a new lease of life with the stage production of Mamma Mia. It opened in early 1999 and continued to run in London for more than ten years, followed by stagings around the world. It received an extra boost as it opened in New York and Broadway in September 2001 and was seen as something to cheer the New Yorkers after the disaster of September 11. Thirty-five years after the success of Waterloo in Eurovision, the film version of Mamma Mia, with its top cast led by Meryl Streep, became a record-breaker (the highest-grossing film in UK history). 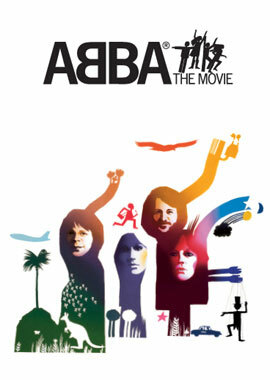 The songs have remained popular – and the play and the film seem to have ensured a long life for ABBA songs. This film is a record of the four members of the group in the mid-70s, when they were in their early thirties. They appear as pleasant personalities, joking with each other, with the various people interviewing them. They don’t say anything particularly startling but seem to be pleasant types. There is a thin narrative thread in the film where a young deejay from a country station is commissioned to get an in-depth interview with them. He is played by Robert Hughes. He is continually missing out on opportunities, arriving late, not having his press card – and has to follow them around Australia for their tour. Into this narrative are inserted a range of songs in concert. The journalist also imagines himself with the group and their singing to him. Interspersed are scenes of the Australian landscapes as well as key buildings like the Opera House. There are also interviews with the general public – which don’t say anything particularly much but show a sense of how people responded at the time. Swedish director Lasse Halstrom was in his early thirties when he made this film. He continued to make films in Sweden including My Life as a Dog. However, he moved to the United States and had a very successful career for more than twenty years, peaking at the end of the 1990s with such Oscar-nominated films as The Cider House Rules, Chocolat and The Shipping News.